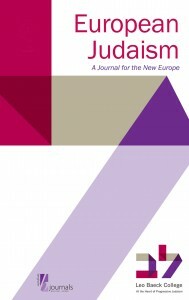 With much sorrow we record the retirement of two extraordinarily gifted women who have been members of the editorial board of European Judaism for many years, the book review editor Evelyn Friedlander and poetry editor Ruth Fainlight. Evelyn is the widow of Rabbi Dr. Albert Friedlander who was editor of the journal from the late 1970s until his death in 2004. Indeed Evelyn was the mainstay of the journal during those early years, soliciting subscriptions, posting out individual copies, storing back issues in their flat and generally ensuring the continued existence of the journal. German-born, a gifted pianist, Evelyn also pursued her own academic interests studying the Jewish life and culture of small pre-war village Jewish synagogues in Germany and mounting exhibitions under the auspices of the Hidden Legacy Foundation. Her publications in the field include ‘Mappot ..blessed be he who comes’, the bilingual comprehensive catalogue of an exhibition of Torah binders (1997) and ’The Jews of Devon and Cornwall’ (2000). From 2004 until 2015 she was chair of the Czech Memorial Scrolls Trust and Director of its Museum. Here are housed 1564 Torah Scrolls and 400 Torah binders from Bohemia and Moravia that were collected in Prague during the war and subsequently came to London in 1964. Most of those that could be repaired have been sent on long-term loan to communities throughout the world. As Evelyn wrote: ‘As soon as I saw the scrolls, I knew that I wanted to be a part of the Trust. In those early days, the racks of scrolls lay as if in a morgue and no one could view them without weeping. And yet my immediate response was that the work of the Trust was the most perfect response to the Holocaust I had ever encountered. Yes, it had come out of the Holocaust but something positive and practical had emerged from that terrible history. In their quiet way the scrolls are a living proof of survival and continuity. « Visit Berghahn Books at ESSHC 2016!